Hey, everyone! It’s an exciting time in the GhostBikes showroom right now, with the Open Event all done and new brands to show off there’s all sorts of new stuff showing up. We’ve even got Dainese gear now! I want to talk about and show off their leathers so badly but I feel like it’s a bit too early. So instead, while the weather’s still wet but more bikers are coming out of hibernation, I might as well put some quality waterproof gear in the spotlight and the Dainese D-Cyclone Gore-Tex Motorcycle Jacket is most definitely worthy of coming in store to try on. Now lets get the bad news out of the way first with this jacket- The price is a staggering £679.95 [prices accurate 30/03/18]. Yes, it’s very steep but it -is- a Dainese jacket, you’re paying for some of the most famously protective and engineered motorcycle gear in the world. Definitely more than just a fashionable brand name. The jacket is utterly jammed full of features to keep a rider protected and comfortable while also being practical. 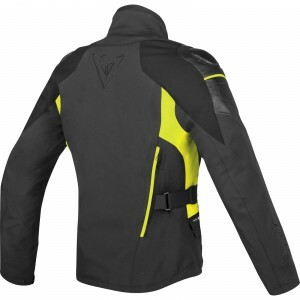 It offers all the protection of leather while having the weather proofing of a Gore-Tex lined jacket. The construction of the jacket is a cowhide leather with high durability. It’s tear and abrasion resistant to save your skin in a slide and is water and oil repellent to help combat the weather. The D-Cyclone Jacket has rigid shoulder protection that is also covered in the cowhide leather, with removable composite protectors and even a CE level 2 Wave G2 back protector- this jacket comes off the rail with some excellent impact protection. Not too many jackets come with decent back protection already installed but for over £650 Dainese were right to put it in there. But there is a pocket for a double chest protector too- so there is still room to upgrade. The Gore-Tex Membrane inside the jacket is your main weather proofing. Gore-Tex is famous for it’s ability to keep rain and wind out but still be breathable for the wearer. Usually it’s the Gore-Tex that adds so much value to these more expensive bike jackets but it really is worth the investment. Especially if you’re a tour biker or ride your bike to commute and commonly find yourself riding in all kinds of weather. This jacket will see you through all weather types. Gore-Tex for the wind and rain and a really fancy thermal liner with high heat retention for the cold days and it’s removable for the hotter days which is best combined with the vent zips on the front and back of the Jacket. The jacket even has a removable padded inner collar, so if it’s feeling cold- keep it in and seal in all the warmth. If it’s hot, you can take it out to let all that hot air flow right out. The Dainese D-Cyclone jacket offers plenty of storage space too for items such as your keys, wallet, phone and just about anything you would expect to put in a pocket, with three pockets on the front of the jacket and another two pockets inside, you’re spoiled for choice. The outer pocket on the front left of the jacket is the only pocket that isn’t waterproof though, so don’t put anything you’d hate to get wet in there just in case. 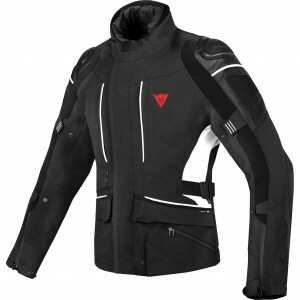 Dainese really are a top brand. I associate the name more with racing leathers and one piece suits but they make some superb gear for the average Joe rider like us commuters and every day, all weather riders. It’s definitely a pricey investment but it’s most certainly worth if for the quality and performance. Look after your D-Cyclone and you won’t need another jacket. If you do end up needing another jacket, it’ll be because the D-Cyclone did it’s job and looked after you.